Bringing manufacturing jobs back to the U.S. is politically savvy and can make economic sense. 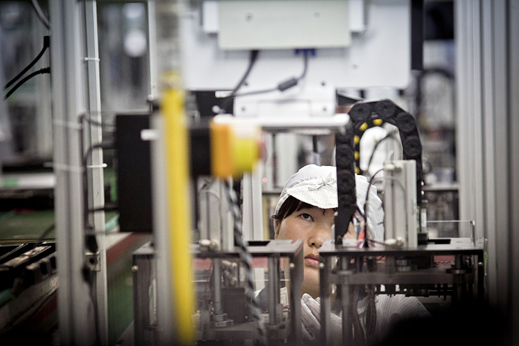 Offshore labor: A worker in a Foxconn factory assembles consumer electronics for U.S. markets. In December, Apple reversed course, saying it planned to assemble a line of Mac computers in the U.S. With that, Apple joined a wave of companies that say manufacturing in this country makes sense again. Companies that say they’ve brought back jobs include General Electric, Michigan Ladder, and Wham-O, which in 2010 hired eight people to make Frisbees in Los Angeles instead of China. An MIT study in 2012 found that 14 percent of companies intend to move some manufacturing back home. The idea is known as “reshoring.” Although Chinese wages are a fraction of U.S. labor costs, rising shipping rates, quality problems, and the intangible costs of being far from headquarters all add up. That’s why some companies have begun to rethink the manufacturing equation. MIT Technology Review interviewed Harry Moser, head of the Chicago-basedReshoring Initiative, about the trend. Moser, a former industry executive whose family has been involved in American manufacturing for a century, says he grew up “experiencing the glory of U.S. manufacturing.” He created the initiative to help companies compare the real costs of manufacturing at home and abroad, and to track the experiences of those who are returning. Why are people talking about reshoring all of a sudden? It’s actually been happening over the last few years. The obvious answer is that Chinese wages are doubling every four years. The consultants who five years ago were helping people offshore are now helping them inshore. And then you have President Obama making a big deal over how to reduce imports and start making stuff again. How much of Apple’s plan to manufacture in the U.S. is real, and how much is window dressing? There’s a lot of speculation about that. Some people say it’s politics. From what I can tell, the units Apple produces in the U.S. won’t have as a high a margin. But it’s also true that consumers are looking for an American product. Think about GE, with its appliance park in Louisville, where they just reshored several products. They say they are going to save $400 million doing that, but then they spent maybe $100 million on advertising what they’re doing. I’ve seen their ad 20 times already. Reshoring is good for GE. Now they can be the good guys. You’ve calculated that about 50,000 jobs have been reshored since 2010. How many of those came back for political reasons? I’d say politics doesn’t account for more than 5 percent. Only a GE or an Apple would think about politics. For everyone else, it’s just a matter of the total cost. They never even broach the political question. Why’d you get into the reshoring movement, and what’s your goal? My family has been in manufacturing for 100 years. My grandfather was a foreman at Singer Sewing Machine, and my dad helped run their factory in what was then the largest building in the world, in Elizabeth, New Jersey. All that is totally gone, and I feel the need to bring it back. The goal is to balance the U.S. trade deficit, which is $600 billion a year. That is largely due to offshoring of manufacturing jobs. Since the 1950s, about three million manufacturing jobs have been lost to imported goods. So to balance the deficit we’ll need to bring back three million jobs. How big will the effect be on high-tech industries? Keep in mind, the vast majority of what Americans consume isn’t high-tech at all. We need to efficiently make ladders and hammers and paper and lights. And we need to do it with the relatively unskilled workforce that we have. Since other countries are targeting high tech, we’ll never dominate it enough to balance the trade deficit. So what types of manufacturing are coming back to the U.S. right now? Most of the products coming back went away only recently, and often without much economic logic—it’s generally mechanical and electrical equipment that has some size and weight, such as transportation equipment, die castings, and foundries. The cost is just too high to ship those. I think appliances fit pretty well into the reshoring story, too, since you are shipping quite a lot of air. How big a part are worries over intellectual-property theft in China playing in the reshoring story? Is that a reason to keep manufacturing close to headquarters? People talk about it all the time, but it’s hard to quantify. It’s a much bigger problem for software, where there’s a disk you can copy, than it is when you are making a refrigerator. A refrigerator is made up of very little intellectual property and a lot of weight. What about advanced technologies for manufacturing? Will they help the U.S. close the trade deficit? I see a lot of trendy over-excitement. Take 3-D printing. It’s pretty far from being a way to make auto parts. And even if we did create that market, we’d sell those printing machines to everyone. So everyone will have them. For instance, total U.S. sales of machine tools—the machines we use now to manufacture things—are $6.6 billion a year. But the use of those tools is worth hundreds of billions of dollars. So the greater value is in putting [manufacturing] technologies to use, not inventing them. I think the return on investment of what we already know how to do—automation, training, lean techniques—is much higher than investing billions into advanced manufacturing processes. If society looks at the returns from the advanced stuff, it won’t be overwhelming.